Chicago, IL. Publisher: Rajput Press. Editor: Minnie C. Holbrook. This combined light occultism with Neo-Theosophy and the Theosophical Society's then penchant for adoptive Masonry. 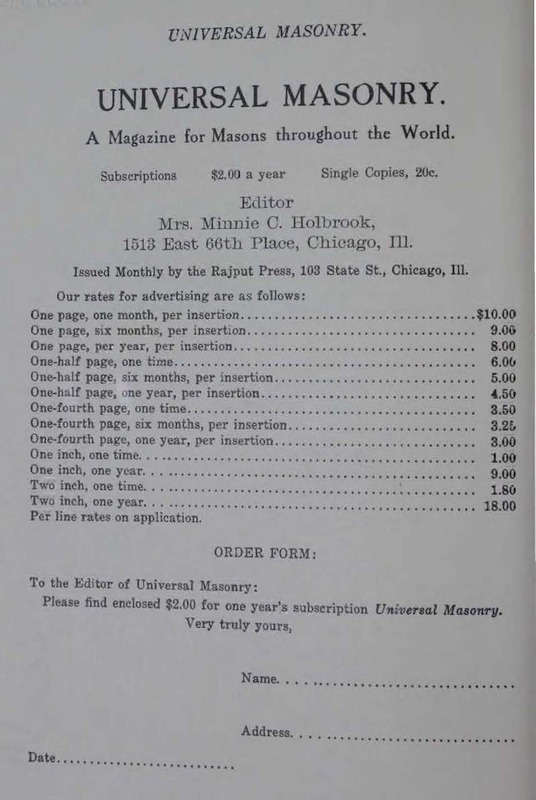 Minnie C. Holbrook (1859-1911) was a convinced Theosophist (hers is one of the lives included in The Lives of Alcyon) and regular contributor to Theosophic Messenger. The journal is notable because of John Yarker's letter in the October 1910 issue on his dealings (by correspondence and astral communication) with Mme. Blavatsky, with her comments on "the tiger Booboo . . . known to all adepts of the East." Iowa Grand Lodge Library.